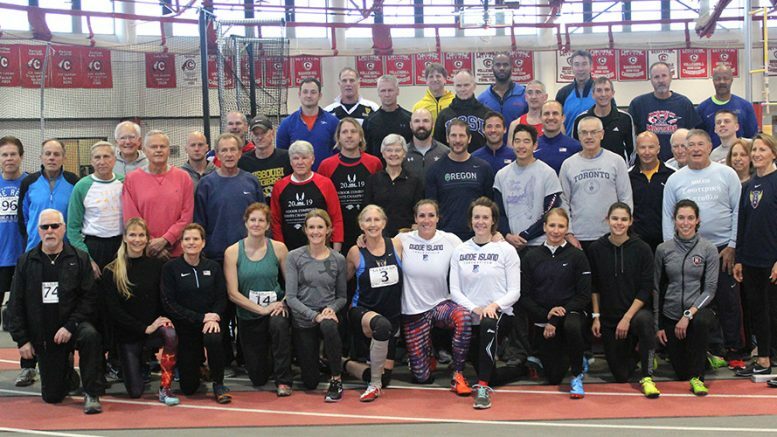 Here are the Mighty Near 50 masters entrants at Kenosha nationals, braving 50-degree temps indoors. Jeff Watry is reporting records set at the USATF National Masters Indoor Combined Event Championships over the weekend in Kenosha, Wisconsin — the site of every listed masters indoor hep record. (This multi is rarely contested.) M85 Bill Jankovich scored 3919 to clobber the listed American record of 2635 by Jerry Donley in 2016. And W40 Angela Herzner scored 4834 to edge the listed AR of 4547 by Erika Pierce, like Jerry’s mark also set in 2016 at Carthage College. Most consequential was the record number of masters entrants — 39 men and 10 women. And they took part despite subzero temps outdoors and travel issues. In fact, W60 Rita Hanscom had to leave early to catch a flight back to San Diego, and recorded a DNF in the last event (the 800) after starting with the open women. M60 winner Noel Ruebel beat fellow nationals meet director Jeff Watry. In any case, Bill did the 60-meter dash in 12.71, long jumped 2.53 meters (8-3 1/2), put the shot 7.68 (25-2 1/2) and high jumped 0.96 (3-1 3/4) on Saturday and did the 60 hurdles in 16.05, pole vaulted 1.60 (5-3) and ran the 1000 in 6:49.14 on Sunday. 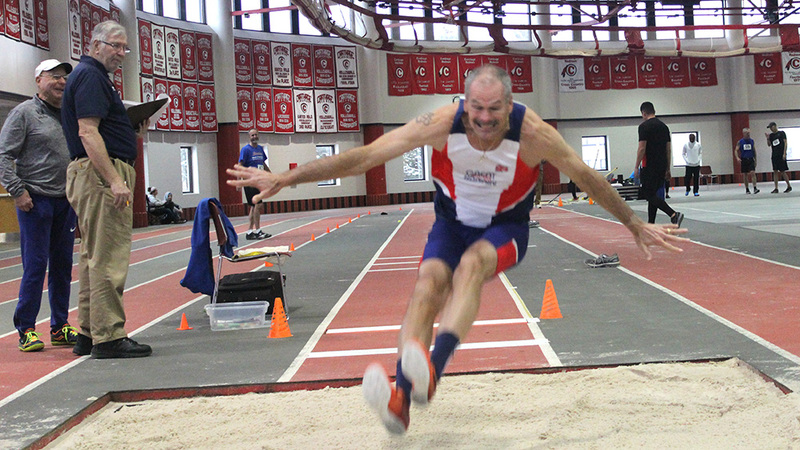 Angela’s marks were 8.84 in 60, long jump 4.43 (14-6 1/4), shot 13.19 (43-3 1/4) and high jump 1.48 (4-10 1/4) on Day 1. She did 60H in 9.91, vaulted 2.80 (9-2 1/4) and ran the 800 in 3:02.94 on Day 2. Fabulous. Saturday also saw men’s and women’s masters miles at the New Balance Indoor Grand Prix in Boston (see results here), with great photos by Dave Albo. Mark O’Shea of Ireland won the men’s face in 4:28.35 and American Sascha Scott won the women’s race in 5:01.32. And I spent much of Saturday covering and photographing the USATF National 50K Race Walk Championships in Santee, near San Diego — and conveniently 10 minutes from my home. Darlene Backlund, 73, was the oldest walker, and she finished all 31.1 miles in about 7 1/2 hours — smiling every step of the way. See my photos and story on Times of San Diego. 1 Comment on "Bill Jankovich, Angela Herzner claim American indoor records at Kenosha masters hep"
Good job Bill—- I look forward to seeing you in Toronto next year !! !